Entrepreneurial Leaders Organization - Afternoon Speaker: Casey Houweling - "How To Be An Innovator: Lessons from the Hot House"
Casey Houweling, Chairman, Houweling’s Group, Delta, BC - Casey is responsible for the Growing oversight for the Houweling’s Group of Companies. Casey brings the entrepreneurial spirit and extensive greenhouse experience learned over his 35 years working in his father’s, and now his family’s Company. Casey led the company from floral nursery roots in British Columbia, Canada to greenhouse vegetable farming, ultimately expanding with the USA farming operations in California and Utah. Additionally, Casey provides consulting services to other Greenhouse Growers located around the world and has developed and patented industry advancing proprietary, sustainable growing technologies. Casey Houweling is a visionary. From the time he was a small boy pruning and picking his father’s vegetables, Casey has known what he wanted to do with his life. He wanted to be a farmer, but not a traditional one. Now in his 50’s, he heads one of the most technically-advanced and environmentally-friendly greenhouse operations in the world. 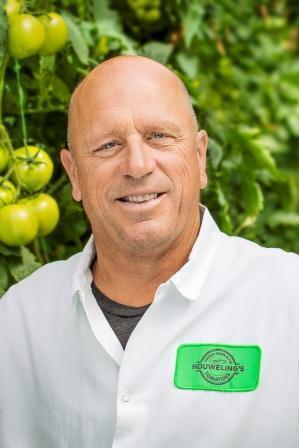 In a world where companies expand through broad and sometimes reckless diversification, Casey believes in specializing in one business – greenhouse tomatoes. The specialist philosophy isn’t new; it’s quite simple, really. He believes that focus and attention to one category (tomatoes) versus an array of fruits and vegetables is critical to enhancing one’s know-how. Ultimately, know-how and passion are the keys to quality. These are just a few examples of why Houweling’s continues to be recognized as an industry leader.